The heart of the Crab Nebula is thought to harbor a neutron star. Lacking a solid theory, astronomers now propose electric current moving faster than light as pulsar power sources. Pulsars are described as "lighthouses" with rotating beams of energy concentrated at specific points. Gravitational theory relies on a rotational mechanism for their pulsations, so when the spin of a pulsar brings its beam in line with telescopes on Earth, a flash of light is visible. However, the rotation rates of some pulsars were clocked at speeds faster than once per second (even with many times the mass of our Sun). Nothing known to science can withstand the forces involved with those spin rates, so "neutron stars" were mathematically created. Only something so dense was thought able to withstand the rotational velocity. Now, according to a recent press release, another mechanism for the rapid blink rate has been proposed: electric currents flowing faster than light speed. Los Alamos National Laboratory scientists theorize that the rotating star's intense magnetic field is generating electricity that is, in turn, causing charge separation to take place. The movement of opposite charges is supposed to emit the beams of light. Several Picture of the Day articles have addressed the problem of neutron stars. According to the Electric Star theory, neutron stars belong with the Celestial Teapot in the imaginary objects category. Deficits in gravity-only cosmology made the neutron star hypothesis necessary because gravity has been granted ostensibly endless powers. 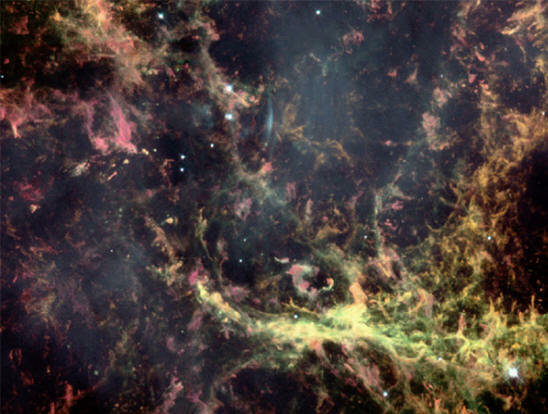 The Crab Nebula pulses 30 times per second, or 30 hertz. That means the star is theoretically rotating 30 times per second. There are pulsars with frequencies as high as 716 hertz, as well. The regular frequency is not mechanically generated, however. Instead, it is the capacitive, resistive, and inductive electrical environment around the star that generates an oscillation. Compacted matter and extreme rotation are not necessary. Electricity traveling through circuits provides a coherent explanation that is consistent with commonly accepted electromagnetic theories, as well as with laboratory experiments. Pulsars are said to be created by neutron stars with magnetic fields measuring over 10^15 Gauss. For comparison, the Earth's magnetic field is about one-half Gauss. It must be stressed, though, that the evidence is indirect and no neutron star has ever been observed. What is observed are intense magnetic fields pulsing at times in fractions of a second. It is a well-established fact that magnetic fields are induced by electric currents. Therefore, there must be an electric current generating the intense fields in a pulsar. It is also indisputable that the feeder current must be part of a circuit, since persistent electric current must flow in a completed circuit. The oscillations in pulsars are caused by resonant effects in electric circuits. The sudden release of stored electrical energy in a “double layer” is responsible for their energetic outbursts. Pulsars do not shine with visible light alone; sometimes X-rays and gamma rays are seen. The outbursts begin with a sudden peak of energy, and then gradually decline, like a stroke of lightning. As the current flows through clouds of dusty plasma it concentrates forces because of the Biot-Savart effect, drawing itself together and forming helical zones of immense compression known as "z-pinches" or "Bennett pinches." Depending on how much electricity is flowing through the circuit, the star's magnetic field will be greater where there is more current. It seems more likely that in pulsars we are witnessing an immense concentration of electricity being focused by some kind of "plasma gun" effect.